I found this picture in the online collection of the British Museum. 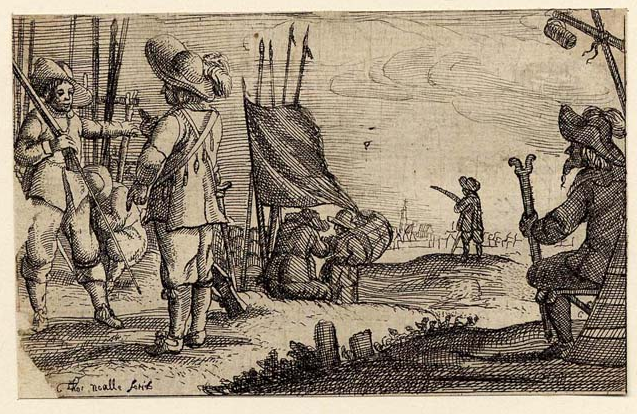 Like a previous post called Soldiers in the Field, this one looks authentic, but has no real provenance from the 1640s, the description stating that the attribution of Richard Gaywood, one of the most prolific of 17th century engravers may be a mistake. Having said that, this is a striking image. A musketeer in tall hat and soldier’s coat looks out of the picture in the classic “thousand yard gaze” of the campaigning soldier. He’s been in action; you can see that. His hat is battered. There are scars on his face and tears in his coat. He has also lost his left hand, which would make it tricky to say the least to fire his musket. We know he was at least originally a musketeer as he still carries a bandolier of boxes as the measured containers of black powder were known then. Details to note on his coat are the permanent turn-backs on his cuffs and the button closing evident below the bandolier and the lack of shoulder wings where the sleeve joins the body of the coat. His coat is open at the neck and shows what might be a knotted cloth. It does’t show the classic open neck and single tie of a 1640s shirt. In the background are a number of corpses draped decoratively with linen rags and another figure in soldier’s garb who seems to have lost the will to live. Perhaps the musketeer is on the winning side and the rest amongst the losers. Who knows? The picture may even be authentic! 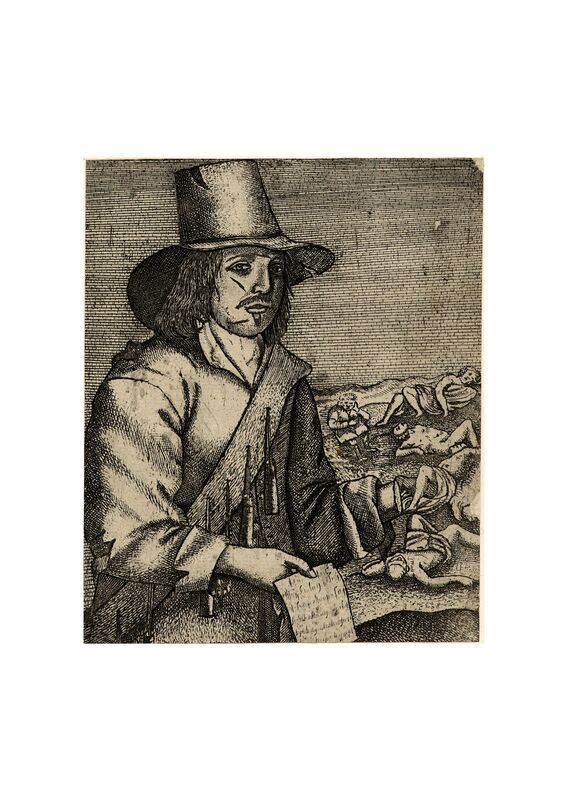 A familiar image from a parliament pamphlet from 1644 which is worth a closer look. 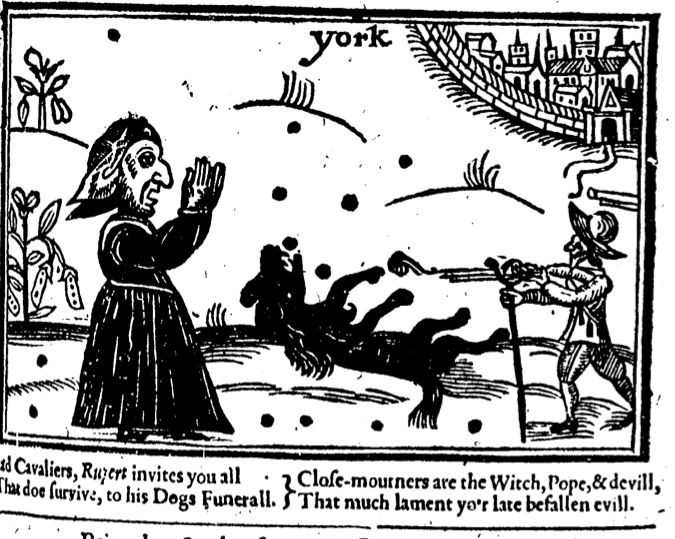 Following the royalist defeat at Marston Moor, Prince Rupert’s lost his dog in the ensuing chaos. The dog Boye, a poodle was widely held to be his familiar, the witchcraft implied presumably explaining his military prowess in the war. Notice the musketeer on the right hand side, a rare picture of an English soldier from this period, though oddly he seems to be firing left handed and has his bandolier of charges hanging where a right handed soldier would hang his sword. Good evidence of a coat though and some understated lace decoration down his left leg. The woman on the left, presumably meant to be a witch dressed in bodice (or possibly a waistcoat) and petticoat with an untied coif.